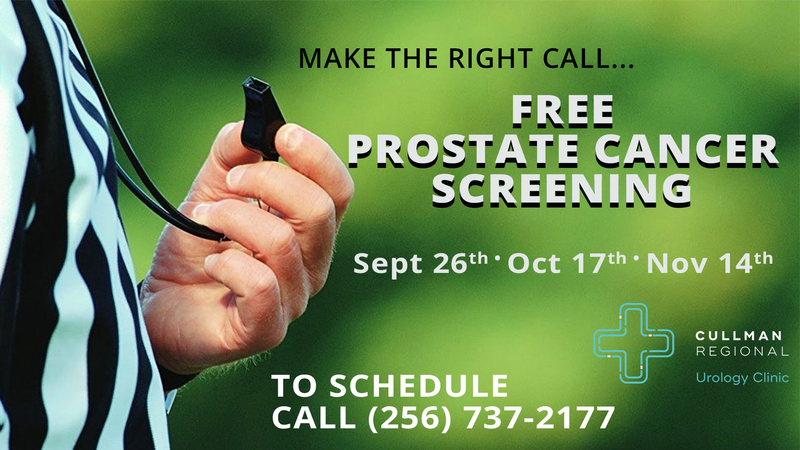 CULLMAN – In recognition of Prostate Cancer Awareness Month, Cullman Regional is offering free prostate cancer screenings in the Cullman Regional Urology Clinic on Sept. 26, Oct. 17 and Nov. 14. While the screenings are free, an appointment is required. Schedule an appointment by calling the Cullman Regional Urology Clinic at 256-737-2177. The screenings offer opportunities to check your risk for prostate cancer through a PSA test and a digital prostate exam. The screenings are available for men ages 50-69 or men older than 40 who have a family history of prostate cancer. African-American men have a higher risk for prostate cancer and should start getting screened at age 40.